I skip breakfast this morning and get out on deck by 6:45AM in order to see our approach to the Panama Canal from the Caribbean side near the city of Colon. The Sun is up and it is raining as we approach the first set of locks at Gatun. My camera lenses are fogged up since I just brought them out from the cool, air-conditioned ship’s interior to the warm and humid outside air. It takes them about a half hour to warm up and become clear of the condensation. I stay outside most of the rest of the day in order to observe all the various fascinating phases of the Rotterdam’s transit. The Gatun Locks consist of three locks, and are the most dramatic of all the Panama Canal locks, since they lift the ship 26 metres above sea level to Gatun Lake. The navigation channel across Gatun Lake forms the largest single segment of the transit. We encounter another tropical rainstorm as we cross the lake. As we move through the narrow Culebra Cut (or Gaillard Cut), freighters are moved out of our way so we can pass, since the dredging of the Cut has narrowed the navigation channel more than normal. Passenger ships such as Rotterdam have priority for daytime passage through the Canal, and actually become a bit of a spectacle for locals, who sometimes park to watch us pass by. As we approach Pedro Miguel Lock (a single lock), the new 6km long Pacific Access Channel is easy to see to our right. It is a huge swath of construction that goes all the way from Pedro Miguel Locks, past Miraflores Locks, and out to the Pacific Ocean. The new locks will consist of three chambers, whereas now Pedro Miguel has one chamber and Miraflores has two chambers with the small Miraflores Lake between them. This $1.5 billion expansion project will deliver a third set of locks capable of moving larger ships through the canal system. The existing lock systems will continue to operate, so throughput will be significantly increased. I find the construction fascinating to see while it is in progress. We experience a beautiful day for our Panama Canal transit. It is not too hot (about 26°C and not too rainy (only 3 rainstorms). I enjoy the day immensely, but manage to pick up a mild sunburn from staying outside most of the day, despite ducking under shade whenever possible. There is a commentator aboard the ship, who describes each phase of the transit and gives some background information about the canal over the PA system. She does not talk continuously the whole day long, thank goodness. I understand the transit charges for Rotterdam today amount to some $350,000, or $250/passenger! After completing the transit, Rotterdam anchors near a small community called Fuerte Amador on the Pacific side, which is in Panama Bay – about a 15 minute tender ride to shore, and about another 15 minute drive to Panama City. 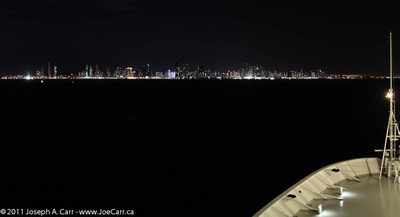 The skies clear this evening, so I go to Deck 6 Forward and take some photos of Panama City at night, which is a spectacular sight! This entry was posted in Panama and tagged canal, cruise ship, dredge, jungle, ship. Bookmark the permalink.